This is the third in a series of posts about my family history. 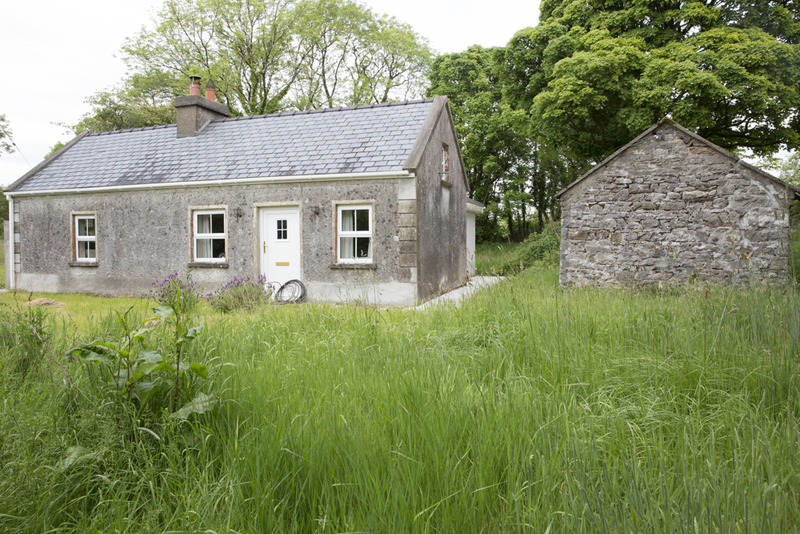 One goal of our recent trip to Ireland was to find out what happened to our Connaughton relatives who stayed when Honorah Connaughton left Bookala in the early 1870s. Honorah’s son, Richard Joseph Dillon, was my great grandfather. 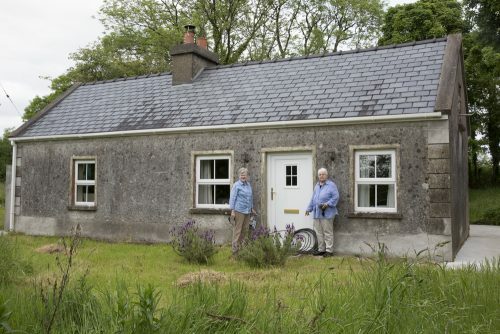 Pictured below are my aunt, Mary Leonard, on the left, and my mother, Patty Crosby, in front of a house where Nora’s niece, Mary, and nephew, Michael, lived. Mary Leonard met Mary and Michael Connaughton in the early 1970s when she and her husband, Tim, and son, Sean, visited Ireland. 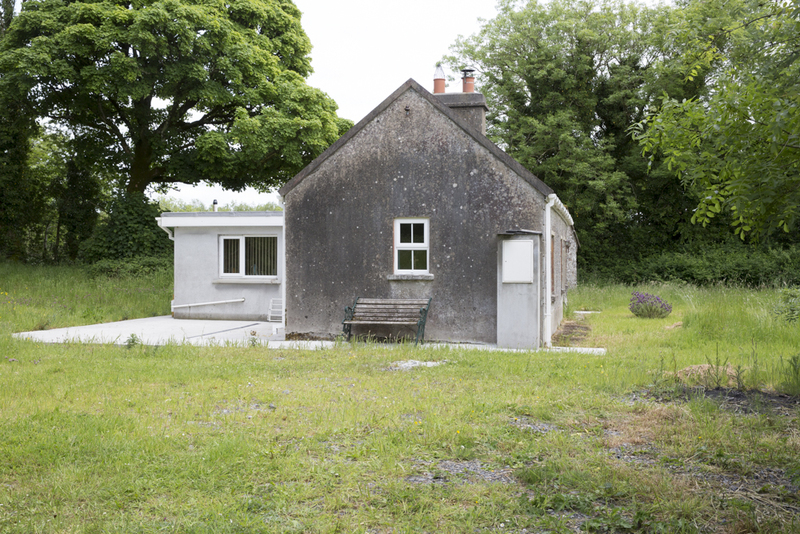 At the time, Mary Connaughton was pleased to have recently gotten electricity to the house, proudly showing off the wire clamped the front of the house and coming in through the front door. She and her brother, Michael, who shared the house, enjoyed listening to the radio. At the time, Mary cooked using a fireplace, fueled with peat from the bog. Michael farmed on a nearby plot. Here’s a page from Mary Leonard’s photo album of that trip. We were told that the home is now owned by a couple who live in England. 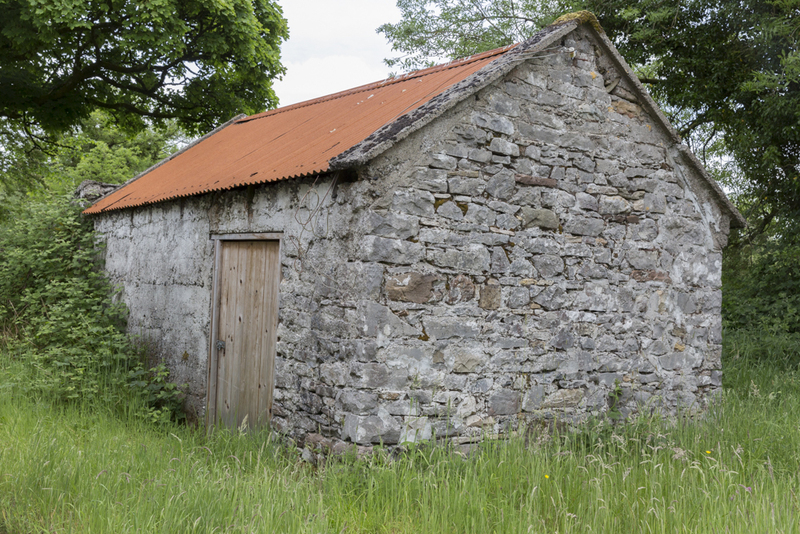 They have made improvements on the property, including adding a bathroom on the back. The shed no longer has a thatched roof. 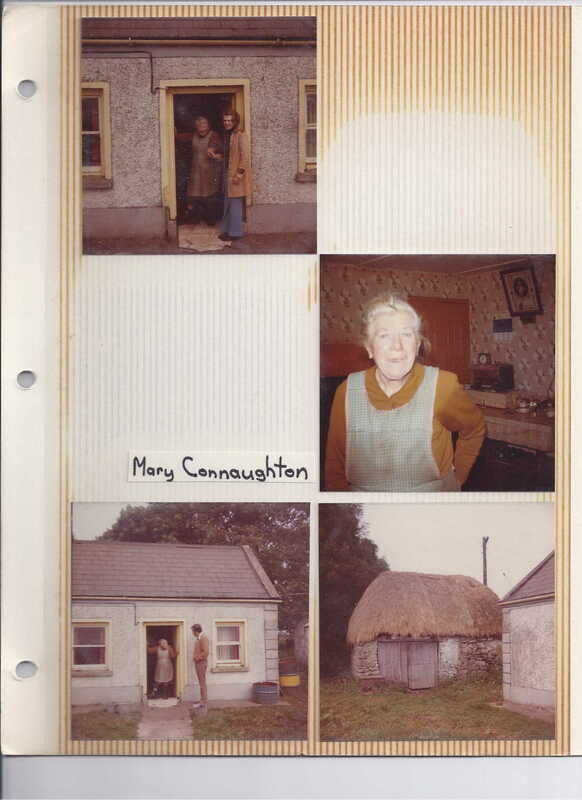 We know from church and census records that Honorah Connaughton lived in Bookala with her parents, Michael and Mary (nee Dillon) Connaughton, and five or six siblings. We would have to do more land research to determine whether they lived in the house pictured above. Honorah’s brother, John, married Katie Ryan on March 17, 1899, and they had two children, Mary and Michael. These are the siblings who were living in the pictured house when Mary Leonard went looking for Connaughtons in the 1970s. John and Katie Connaughton each lived to be 83 years old. Mary and Michael never married and had no children. Mary lived to age 85; Michael to age 76. The rural road in front of the Connaughton family place reminded me of rural Mississippi where I grew up. Before our trip to Ireland, we made arrangements to host a gathering of any Connaughtons who might be family. With help from the proprietor of Gleesons Townhouse, we spread the word to local people. They posted a flier, we took out an ad in the newspaper, and we announced the gathering at mass at St. Bride’s in Ballintuber. In addition, Mr. Gleeson put us in touch with Mr. William Gacquin, the county historian in County Roscommon. When he came to our gathering, he brought a paper he had written in 2000 on the Connaughton family name. As of 1994-95, Connaughton was the 50th most popular name in County Roscommon. However, it appears that in our line of Connaughtons, the name has died out in Ireland. Since we have only been able to trace Honorah’s descendants in the United States, we do not know of any Connaughton relatives in the U.S., either. In my grandfather’s generation, they were Dillons, Webers, and Middendorfs. In my mother’s, they became Crosbys, Weldes, Leonards, Dillons, Fishers, Sanfords and the Weber women’s husband’s names, and the Middendorf women’s husband’s names. Patrick Connaughton, who appears to have been Honorah’s oldest brother, married in 1875, the same year his father, Michael, wrote to Honorah in Lowell, Mass., to thank her for sending money and reporting on the family’s condition and health. Patrick, a tailor aged 26, married Mary Gara, a dressmaker aged 23. 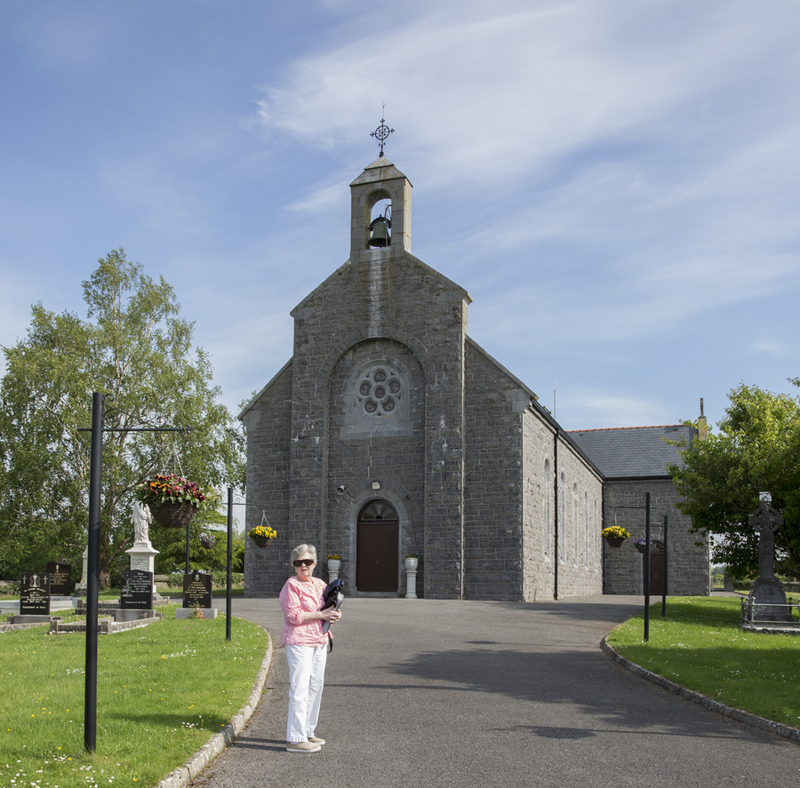 They settled in Castleplunkett, where Mary Gara’s father farmed. Patrick lived to 96; Mary to 78. They had nine children: Mary Kate, Michael, Patrick, Thomas, Brigid, an unnamed baby daughter who lived three hours, Anna, Sarah, and Lizzie. By 1901, Mary Kate, age 25, was a teacher in the National Schools and lived in County Louth. Living with her were two of her younger sisters: Anna, 9 years younger, and Sarah, 11 years younger. We learned that Anna also became a teacher in the National Schools. In 1911, she was boarding with a Jacob family in Leixlip, County Kildare. She died in 1921 at age 26 of a burst appendix. Eilish Feeley, a genealogist with whom we worked, located a will indicating that Anna left 100 pounds to her father. This was a relatively large sum. We don’t know if she was very frugal and saved nearly all her earnings or whether the money was a death benefit from some kind of insurance. We also have a death record for a Sarah Connaughton in Louth; she died at 64 of Parkinson’s disease and is listed as a retired dressmaker. Her age at death does not seem to match our Sarah’s age. Michael, a tailor, married Kate Dufficey. They had no children. Michael lived to 83 and was listed as a farmer when he died. Thomas married Matilda McCormack. She died in childbirth with daughter Mamie. 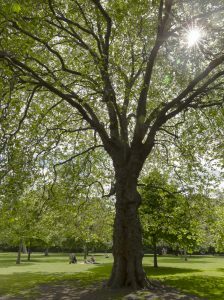 (A family story has it that Mamie went to live in Dublin with one of Thomas’ sisters. Maybe Mary Kate?) Thomas then married Bridget Harte. They had eight children: Thomas (known as Tommy Joe, he moved to US and applied for US citizenship in xxxx), Patrick (died without children), Elizabeth & Anne (twins who moved to the US around 1948; Elizabeth, known as Lilly, returned to Ireland in 1951. Anne married a James Dolan who was in the U.S. Army), John (died young), Micheal (married Mary Forkan, settled in Castleplunkett, farmed, had six daughters), James Desmond (died young), and Peter Gerald (lived most of his life in England; he and his wife died in Dunboyne, Ireland; they had no children). Brigid married Patrick Keane and they had two children: Joseph and Patrick. Brigid and Patrick had three grandchildren: Tony, Des (Milltown, Ireland) and Martin (Ballintubber). A census record also indicates that the youngest of Patrick and Mary’s children, Lizzie, was training to become a teacher. As I noted in a previous post, many of Honorah’s descendants who live in the United States are teachers. Several are also accomplished sewists. Today, I’ll move into the next generation in the family history. My great-great grandmother, Honorah Connaughton, a native of Bookala, Ireland, settled in Ludlow, Kentucky, sometime before January 31, 1883. We found that date on her application for a license to marry Richard Joseph Dillon, an American born to Irish immigrants. At the time of their marriage, Nora, as she was known, was 27 and Richard was 30. 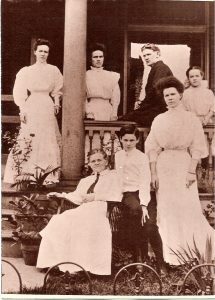 Together they had six children: Mary Theresa, Elizabeth “Lizzie”, Richard Joseph (my great grandfather), Nora, Thomas Xavier, and Ella. Honorah is pictured here with her children. We believe but don’t know for sure that the photograph was taken in front of the family home. We do not know the circumstances of the photograph being taken. Everyone seems dressed up. Honorah died of pneumonia on August 10, 1914, when she was 58 years old. Her youngest child was 18. She is known in the family for making sure that all of her children were educated and played a musical instrument. Her two sons graduated from Xavier College in Cincinnati, OH, and Tom became a lawyer. Later in his career, he farmed. Nora’s four daughters finished high school. One daughter, also named Nora, became a nun, and may have pursued education beyond high school. I am calling my great-great grandmother, Nora the Great, because she left Ireland at 16 and made not only her living during her early years in the US, but sent money home to her family. At least some of her work was as a seamstress. Honora and Richard’s oldest daughter, Mary Theresa, died in 1918 during the worldwide flu pandemic. She was 35. Richard lived to be 83 years old. 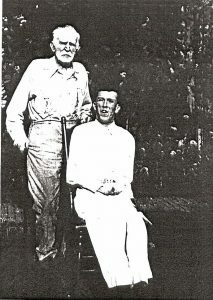 He is pictured here in an undated photograph with a grandson, John R. Dehore, who was born with special needs and with whom Richard had a special relationship. Richard’s daughter, Lizzie Dillon, had married John William Dehore sometime before 1917. They had five children; John R was the youngest and was born when his mother was 39 years old, a little over a year after the birth and death shortly thereafter of another John. Richard Joseph Dillon married Clara Scholten (here’s where the Germans enter the family). They had three children: Dorothy Clare, Richard Thomas (my grandfather), and Jeanne Alice. Thomas Xavier Dillon married Mary Sullivan. They had six children: Thomas Xavier Jr., John T., Maureen (Sister Colleen), Joseph, Lawrence, and Margaret “Peg”. Maureen and Peg became nuns and John T became a priest. Maureen earned a PhD in Linguistics from Cornell University. Ella Dillon married Gregory Joseph Shipley. They had two children: Mary Ellen and Gregory Joseph Jr. 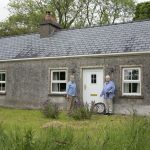 Sometime during the 1970s Ella Dillon Shipley visited Bookala, Ireland, and met Michael and Mary Connaughton, who were a nephew and niece of Honora. Michael and Mary walked Ella to a nearby plot of land that had been the birthplace and home of Honora’s mother, Mary Elizabeth “Bessie” Dillon. One of the crazy things about sorting out all this family history is the fact that Honora’s mother’s maiden name was Dillon and Nora’s husband’s last name was Dillon. The Connaughtons also, like many Irish families, reused names in every generation so it is hard to keep from confusing fathers with sons, mothers with daughters, siblings with nieces and nephews, and grandchildren with everyone else. During a trip to Ireland in May with my mother, Patty, and her sister, Mary, I learned a lot more about our family’s roots in Ireland. Some things about our little origin story rang true to everyone we met, including genealogists and historians. But some things did not. Aunt Mary is the family member most responsible for what we know about our family history, especially the Irish side. She started her serious work in the 1970s, writing to older family members and collecting photographs and letters, and has continued to invest time and money in the effort. A key document in tracing our Irish foremother was a letter written by Michael Connaughton, dated July 22nd, 1875. “My dear and beloved daughter,” begins the letter to Honorah (Nora) Connaughton. Though we have no birth record for Nora, her husband reported on her death certificate that she was born in 1855 and was 58 years old when she passed away on August 10th. Since her birthday seems to have been after August 10th, she was likely 19 years old when this letter was written. Michael was about 61. The letter contains tons of information that genealogists were able to use to trace the family, including Michael’s list of his other children and reports of where they were living and what they were doing; his notation that he was writing from Bookala; his mention of other nearby towns, one, Ballymoe, where he went to collect the 2 pounds 11 shillings and 6 pennies Nora had sent home, and two, Castlerea, where he planned to go to pay his rent “to Mr. MK,” and his signoff, which included the name of his wife, Mary. He reports that Mary’s “hand is none better or worse” and that “The shortness of breath is my worse (sic) complaint which I am afraid will never part with me.” He died two years later. We know from census records that Michael and Mary (nee Dillon) Connaugton had seven children (Sarah, Patrick, Nora, Anne, Michael, John, and Mary Kate). They rented their house and land in Bookala from Sir Thomas John Burke. They could read and write English and Micheal made at least some of his living as a tailor, a skill he passed on to at least some of his sons and daughters. Though Michael’s letter mentions that Nora was living in Lowell, Massachusetts, in 1875, we have little information on her time before she settled in Ludlow, Kentucky, and married my great-great grandfather, Richard Joseph Dillon, born in America in 1853 to Irish immigrants named Patrick Edward Dillon and Bridget Healy. We have a boilerplate letter of introduction written by a priest to be shown to prospective employers or landlords and we have Micheal’s mention that she owns a sewing machine that she is using in part to make her living. 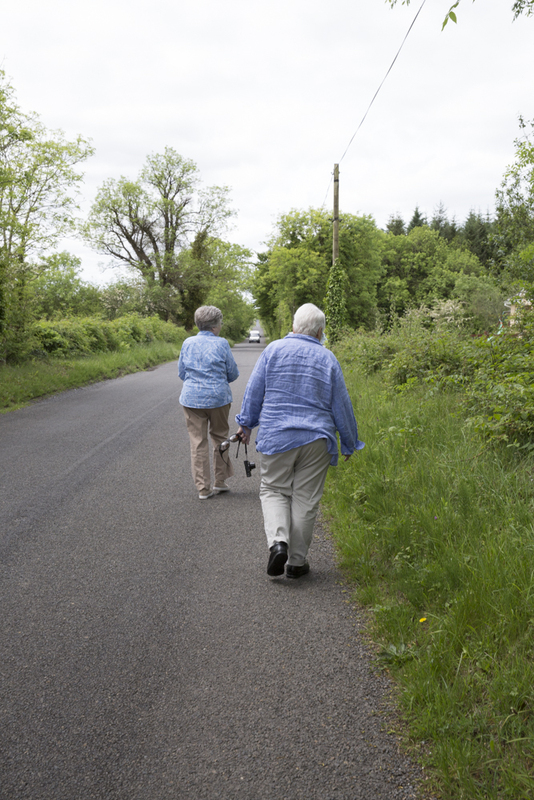 During the Ireland trip, Aunt Mary told me that the story she had heard had never included a trip to town for groceries, much less lettuce, but that Nora had gone out that day to visit friends. Mary had also heard that Nora had walked to a town and taken a train. Mr. William Gacquinn, a historian in County Roscommon, confirmed for us that trains were running through County Roscommon by that year and that she could have gone by train to a port city like Galway or Dublin for her trip to the United States. Delving into this family history has been really interesting to me, especially since the family members I grew up knowing share lots of traits with these Irish relatives: there are a lot of letter writers, teachers (which gets more relevant in the next generation in Ireland), and sewists. Just like Micheal and Mary’s family in Bookala. *This is a first installment in my attempt to pull together some of what we’ve learned into a narrative that can be followed and can serve as a springboard for further inquiry.